We had a lovely evening with the girls last night. We returned home after a long weekend of travel, an afternoon visiting with family and then relaxed by enjoying some card games with them before bed. They'd attended a weekend camp put on by the American Cancer Society for siblings of those with cancer called SunSibs. The counselors are former attendees in many cases and the staff are social workers and hospital child-life staff. Last year was their first time going, right near the beginning of Henry's radiation treatments. They both anticipated this year for the last month by recalling fond memories of swimming, pranks, songs and activities. Dropping the girls off on Saturday morning was a oddly disconcerting experience. We recalled what was happening last year - just starting Henry's radiation treatments, preparing for more separation, more hospital time, the unknown. When I recall past times during Henry's treatment I have enormous empathy for our past selves, wanting to comfort them, tell them we're doing OK now, encourage them. Then I realized that the parents still standing there were quite possibly in that very place, right in front of me. Other parents were there with their surviving children as we were, many years out, making me wonder what that's like. I heard cell phone conversations about one parent swapping hospital duties with the other. This story continues to happen over and over again all the time - all over the world. We picked Anna and Sophie up on Monday and, although visibly tired, they were happy and had spent a busy weekend enjoying their old and new friends and the love and companionship of those who cared for them by offering them a fun and carefree time. It made Tara and I very happy to see them confidently marching off to camp and returning with memories that we hope will continue to buoy them and give them another facet of identity within the cancer community. Grief for me is changing again. I haven't cried as much recently. I can more often stand at the door of his room and imagine him, remember him and smile. I think of him and feel the clenching in my chest, but it has become more familiar to me now, that manifestation of grief. And most of the time, that grief has enough form that I can hold it without it spilling all over the place uncontrollably. It has begun to congeal into something that is still difficult to hold, but it's possible. Sometimes it is still collapses into pieces but I'm getting more accustomed to picking them up and understanding how they fit together. The time since Henry died has been many things. It's been free from cancer. There have been moments of great joy and moments of deeper sadness than I've ever experienced. We've been touched by the generous acts of love and support of community reaching far and wide as well as back into times of our past and have gotten a glimpse of the community that will take us into our future. But it's also been completely disorienting. For the last decade Tara and I have been parents of small children. We'll be the first to admit we're not the most adept parents of little ones, but we enjoy it and have grown to appreciate the chaos and unpredictability they bring. Acceptance. They force you to be open to whatever experience the moments bring. Spilled milk, a funny face, tears one minute, laughter the next. Henry was four, but still needed the kind of attention a younger child requires. Taking him to the bathroom, for example, was something he did for himself only very rarely. Simple jobs required attention and coaching. This was our way though. Our interaction became oriented around these jobs, these duties. These were the motions of our days. Suddenly now, our youngest is almost 8. Overnight we've gone from attentive care to near independence. And while its something that parents long for when you're in the midst of the responsibilities of child rearing, you graduate out of it gently and come to appreciate the difference. Sometimes now, I know I have so many things to do, many of them feel hollow and pointless. I can't keep thoughts in my head and have difficulty managing priorities. Small things overwhelm me and feel oppressive. I'm frozen by simple decisions and when I can finally decide I'm emotionally exhausted and often feel like I'm disappointing the people depending on me. My consciousness seems clouded by a thick fog and the effect is almost constant confusion. This morning has given me a moment of clarity and with it the chance to think about things a bit more thoughtfully. Is this part of grief? Am I just tired? Am I still just looking for my balance? I'm sure this will pass but for now it's frustrating. The days are beautiful, school's almost out, and spring activities are almost over but life seems to be moving at light speed and I feel like I'm crawling with confusion. This weekend's Henry's Hustle event was an incredible time. The Maugansville community displayed enormous support and compassion to the cause of pediatric cancer research and awareness all in Henry's name. The fervor began to build on Friday as the news crew from our local TV station came to witness some preparation and to interview the organizers, the girls, and me. Here's a clip from Friday's news story. Saturday morning's weather was brilliant until about race time and the skies began to open. We went ahead with the race anyway and the kids loved it. The Chick-fil-a cow came to begin the race and was instrumental in getting many other activities started as well. After the race the weather began to clear up a bit and everyone was able to enjoy the activities. There was a wonderful tractor ride and the local fire company showed up with one of the engines that Henry loved to watch from the nearby ice cream shop. Many of the children's teachers sacrificed themselves for the cause in a dunk tank which was VERY popular! There was plenty of carnival fare provided by local businesses who donated their profits back to the cause, a multitude of amazing cakes for a cake walk, sweets galore for the bake sale - all of which was a tremendous donation of time and resources. The school's music teacher and her talented band came to add a festive atmosphere to the day and played song after song of touching entertainment and joyful music. (One special song of which was a favorite of Henry's - The Sweet Escape, which he called the 'woohoo song'). One of the local families donated the use of their Moonbounces for the enjoyment of all, another very popular activity. There was face painting, balloons, remote control cars from RideMakerz, goldfish to win, and enough activities to keep hundreds of kids and their families busy and entertained for hours. And of course, there were two Alex's Lemonade Stands on site as the namesake for destination of all the funds raised. Altogether it was just a terrific, wonderful and magical day. It was a show of such solidarity, community and compassion. Tara and I felt so very comforted to know that Henry's life and story continues to inspire people to reach out to those children touched by cancer, to challenge them to empathize and to act. It means that his short life continues to radiate out into the world with positive ramification and it just makes us so happy. I feel at such a desperate loss of words to express our gratitude for the countless hours of volunteer time that went into this event to earn funds that those who gave their time will likely (and hopefully) never see the use of. I know that every cake that was baked, every phone call that was made and every minute of service went to help sick children and it was done out of such deep generosity. We're so very honored for it to have been in Henry's name. Much credit goes to the preparatory work of the Maugansville Elementary School staff, PTA and the local Ruritan club for the use of facilities, resources and good old volunteer labor. I'm especially grateful for Jeremy Golden, the Physical Education Teacher at Maugansville for his idea, initiative and compassion that made Henry's Hustle a reality. 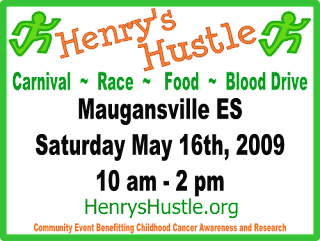 The Henry's Hustle event at our local elementary school is gaining momentum and is shaping up to be an outstanding event! There are multiple activities being provided, including a 1-mile run (Henry's Hustle) to be started by the Chick-fil-a Cow, train rides, car racing from RideMakerz, a dunk tank, soccer shoot, cake walk, blood drive, many valuable raffle items and the enjoyment of a community that has really extended itself to be supportive of childhood cancer research and, of course, our family. The scale of the event requires many volunteers for setup and execution of the day's activities. If you're willing to donate all or part of your time between 7am and 3pm that day, it would be deeply appreciated. The event itself is from 10a to 2p plus the set up and break down afterward. Send me your email address and when and or what you would like to help with and I'll forward it to the volunteer coordinator for the day. Thank you in advance and we're looking forward to a wonderful community day helping to cure childhood cancers.